I just loved the DT creations last week, and I hope you did too. Thank you to those of you who participated in the Happiness challenge and link-up as well. Don't forget to link-up your recent creations at the bottom of this post. Ribbons, Glitter, and Glue...Oh My! Now, it's time for another link-up party!! Please link up no more than 2 posts and tell your friends to link up too. The more that link up, the more inspiration we have! The link-up party will go through Tuesday night. Please grab my Link-up button below and place it in your post that you linked up. This helps others to see it and come participate in the link-up party! Thanks! JUST CLICK IT. Each click is a vote for me and makes me feel loved! Thanks! nothing more fabulous than a linky party! These 3 are very nice selections. Congrats gals. 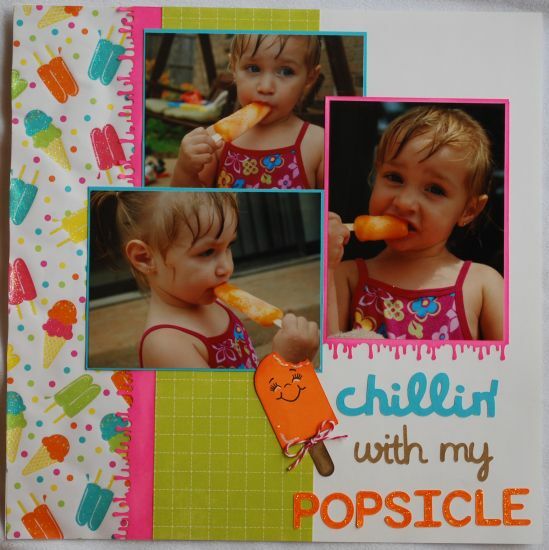 I can relate to the popsicle layout--which is darling!